The most reliable dew control is using dew heaters. But it’s not cheap. Heating strips for most telescopes will set you back at least $100, and you still need to buy the controller, which can range anywhere form cheap 2-channel controllers for $100, to multi-channel for several hundred dollars. All serious astronomers will likely get a real dew control system at some point. But for someone just starting out and in need of a lot of gear, forking out $200 plus buying a heavy-duty battery that can handle the stress of dew heaters is not necessarily feasible. When it comes to my scopes, I have the heater setup, so its not an issue. 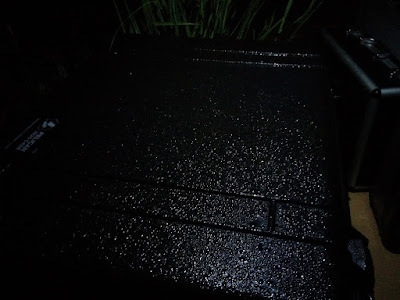 I can last out the most humid of nights where everything else I have outside is soaked, but my optics are totally dry. Since I live in a particularly humid region in southeastern Ontario, it’s a must. But when it comes to shooting with just my cameras, that’s not really a viable option. But there is hope! Then there’s night photographers using just a camera and lens. Battery operated dew control solutions take time to set up, and not everyone wants to drag around a car or marine battery during a session. Most photographers like their mobility. So an electric dew control solution isn’t really an option. In my last blog entry, How To Shoot The Milky Way and Night Sky With A DSLR Camera, I touched on dew control and how I go about it. With the use of chemical hand warmer packets, I can keep my lenses dew-free through the most humid of nights. My original setup was 2 hand warmers attached to my lens with a rubber band. This worked great and saved many of of my photo sessions. More recently, I upgraded to a LensMuff by Digital After Dark, a small nylon sleeve with velcro fastener that can hold some hand warmers and snugly attaches to my lens keeping it nice and warm. For more information, you can just click on the link provided to get the detail. And I can’t recommend the LensMuff highly enough. It’s a cheap, lightweight solution for any photographer that shoots at night. However, what I did want to share is how I applied that idea for a dew control solution for my friend Kevin. I’ve mentioned Kevin in a few of my blog entries, as he’s been my “partner in crime” for astrophotography since I started. He was actually the one that got me taking pictures in the first place. My first astro photos were shot using his Nikon D60 attached to my telescope. Kevin doesn’t have a set up anywhere near as elaborate as mine. He’s been slowly piecing his equipment together since last summer. 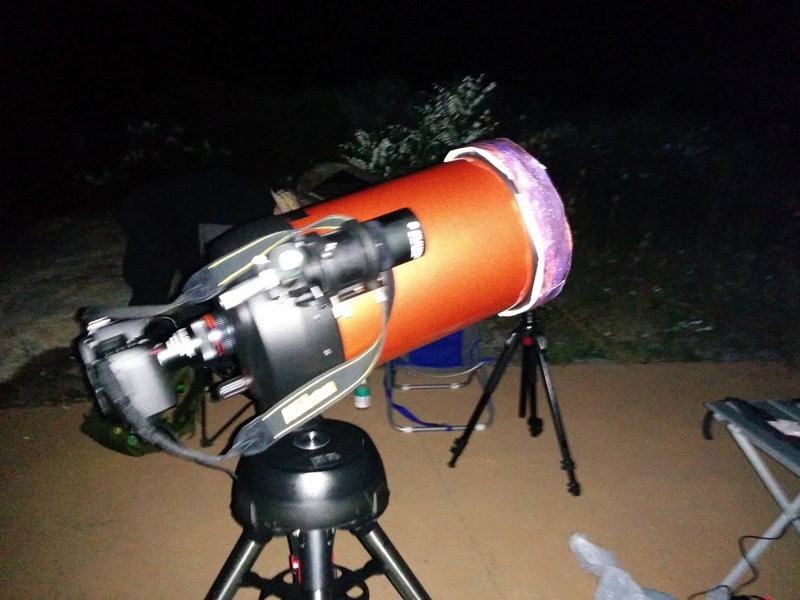 He uses a Celestron 8SE and Nikon D90 along with a bunch of other accessories. Overall, his set up works quite well and has gotten him some decent results. But his big nemesis is definitely dew. Last night, he was hesistant about dragging all his gear out due to the high humidity we were dealing with. And rightfully so, as many of his sessions have been ruined by dew. There’s nothing more frustrating or disappointing in this hobby than dragging all your equipment out to a remote location to have your gear fog up within the first few minutes after removing your lens cap. But I had an idea to take my “ghetto” dew control to the next level. Hand warmers attached to a strip of duct tape. The solution was rather quite simple – 8 hand wamers (probably could have gotten away with using 6) attached to a strip of duct tape. Kevin was rather doubtful at first, but I think he’s learned to trust my crazy ideas and was game to go for it. So a quick mental calculation (c=2πr – high school math ftw) gave me a length of roughly 25 inches to go around the circumference of an 8″ mirror. Kevin took out his roll of duct tape (with a space pattern instead of the usual grey! ), cut a 28″ strip and laid it down, sticky side up. 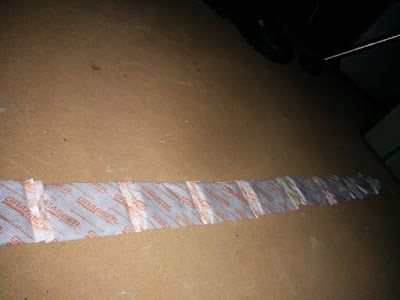 Hand warmer packets were opened, activated with a couple of minutes of energetic shaking, and lined up along the length of the tape. This was then attached to his optical tube as shown in the image below. It was ghetto as hell. It looked ridiculous. But in the end, how your equipment looks in the field really doesn’t matter. Function always takes precedent. And if you find a reliable, home-grown solution to a problem, go for it! The picture on the right was taken as we started tearing down our gear at 3 AM. Despite a crazy amount of dew that had collected on everything else that was exposed to the night air, his optics were dry and clear. Note the quantity of dew on the finder scope lens. His corrector plate would be looking like this without my ghetto dew strip! For an idea of just how much dew we were dealing with, take a look at the picture below. This was the lid of the Pelican Case that I carry my 8″ Meade LX90 optical tube in. 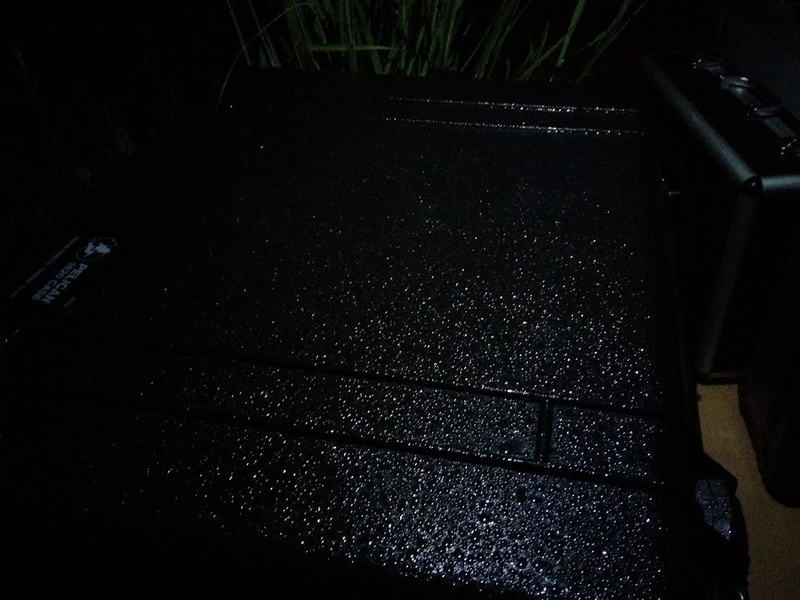 It was covered in dew, as was the rest of our equipment. The ghetto dew strip worked wonders. It was giving off more heat than my premium electric dew strip does. Not bad at all! Now, as ghetto and cheap as this is, over time, this could be costly. I get a large pack of 20 hand warmers (10 x 2-pack) for $13 + tax (about $15) at Canadian Tire. That adds up to about 75 cents per hand warmer. For a camera using 2, that’s not too bad at $1.50 per camera. Using this solution for an 8″ scope, this came out at a cost of $6. As a 1-time cost, it’s not bad. But over time, that adds up pretty quickly. I wouldn’t suggest anyone using this as a long-term solution unless you can get hand warmers in bulk at a cheaper price. But for an occasional dew-control solution, this one is a proven winner that was tested under pretty extreme conditions. We couldn’t have asked for any better than this. Of course, this technique can be used on various other scopes too. You can use this to keep finder scopes dew-free as well. 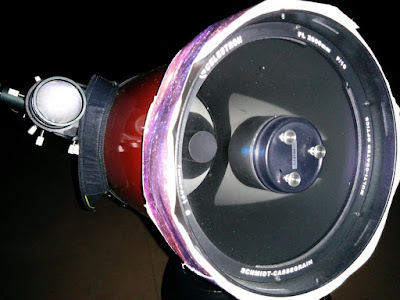 You can easily do this to any refractor or Mak-Cass and use even fewer heaters. Want to keep eyepieces dew free? A hand warmer and a rubber band will take care of that too! Over the course of the winter, I may even try to make some kind of case to hold some hand warmers to the back of my scope’s hand controller. I don’t get out much in winter with my scope, because as soon as the temperature hits -5ºC, I can no longer read the display on my controller. I can potentially fix that issue and make my gear useable in winter! So I hope this will help people who need a dew control solution but just haven’t quite got the money to fork out for an expensive electric solution. If you have any comments, ideas, or suggestions to improve what I’ve done, please feel free to leave them in the comments section below or hop on over to my Facebook page @ https://www.facebook.com/darkartsastro and leave your comments there. So until next time, clear skies, and keep those eyes and lenses pointed up!